Angeles City (Philippines) – November 29, 2018 (travelindex) – Best Western Hotels and Resorts will open its first SureStay hotel in The Philippines in the second quarter of 2019, inviting the country to experience one of the newest hotel brands in the industry – the SureStay Hotel Group. The hotel will feature 56 well-appointed guest rooms with an impressive array of amenities, including an outdoor pool, restaurant, café, and business services, all at an attractive price point. Perfectly located on Surla Street, a main thoroughfare in downtown Angeles City, the property’s setting is ideal for guests looking to be in the heart of the city. Guests will be able to explore the local area with the city’s many attractions available within a short walk of the hotel, including the SM City Clark mall, PAGCOR casino and Fields Avenue “walking street”. The property will be easily accessible via Clark International Airport which offers direct connections to major international cities including Hong Kong, Singapore, Shanghai, Dubai, Seoul and Taipei. Developed by Tambayan Hospitality Group Inc., SureStay Plus by Best Western Regency Angeles City Clark will be operated under a franchise agreement with SureStay Hotel Group and Best Western. 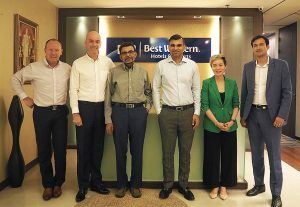 The signing ceremony was attended by Abdul S. Jamal, Chairman of Tambayan Hospitality, and Olivier Berrivin, Best Western’s Managing Director of International Operations – Asia. Best Western currently operates five hotels and resorts all across The Philippines, making it one of the country’s largest international hotel operators. Best Western Hotels & Resorts headquartered in Phoenix, Arizona, is a privately held hotel brand with a global network of 4,200* hotels in more than 100* countries and territories worldwide. Best Western offers 13 hotel brands to suit the needs of developers and guests in every market: Best Western®, Best Western Plus®, Best Western Premier®, Vīb®, GLō®, Executive Residency by Best Western®, Sadie HotelSM, Aiden HotelSM, BW Premier Collection® by Best Western, and BW Signature Collection® by Best Western, as well as its recently launched franchise offerings: SureStay® Hotel by Best Western, SureStay Plus® Hotel by Best Western and SureStay Collection® by Best Western. Now celebrating more than 70 years of hospitality, Best Western provides its hoteliers with global operational, sales and marketing support, and award-winning online and mobile booking capabilities. Best Western continues to set industry records regarding awards and accolades, including 66 percent of the brand’s North American hotels earning a TripAdvisor® Certificate of Excellence award in 2018, Business Travel News® ranking Best Western Plus and Best Western number one in upper-mid-price and mid-price hotel brands, and Fast Company honoring Best Western Hotels & Resorts with a spot in the Top 10 Most Innovative Companies in the Augmented Reality/Virtual Reality category. Best Western has also won nine consecutive AAA®/CAA® Lodging Partner of the Year awards, recognizing the brand’s commitment to providing exceptional service and great value to AAA/CAA’s nearly 58 million members in the U.S. and Canada. Best Western-branded hotels were top ranked in J.D. Power’s 2017 North America Hotel Guest Satisfaction Index Study – ranking first in breakfast (food and beverage category) for midscale; and second in overall guest satisfaction. Over 35 million travelers are members of the brand’s award-winning loyalty program Best Western Rewards®, one of the few programs in which members earn points that never expire and can be redeemed at any Best Western-branded hotel worldwide. Best Western’s partnerships with AAA/CAA and Google® Street View provide travelers with exciting ways to interact with the brand. Through its partnership with Google Street View, Best Western is the first major company of its size and scale to launch a virtual reality experience for customers, setting a new industry standard and reinventing how guests view hotels. * All Best Western and SureStay-branded hotels are independently owned and operated. * Numbers are approximate, may fluctuate, and include hotels currently in the development pipeline. Copyright © 2019 Visit Samoa. All rights reserved.